Pet waste is full of bacteria, parasites, and other harmful organisms that can negatively impact the health of humans and also our pets. When it rains, improperly disposed of pet waste makes it way down stormdrains, and out into Charleston's surrounding water bodies, causing all sorts of harm. It can lead to increased algal growth, decreased oxygen content in the water, and can even fish kills when it reaches our waterways. Please make sure you are doing your part to clean up "behind" your four-legged friend, including when it's in your own backyard. "It shall be unlawful for any owner, keeper or walker of any dog or cat to permit his or her dog or cat to discharge its excreta . . . unless such owner, keeper or walker immediately thereafter removes said animal’s excreta from the public or private property in question." 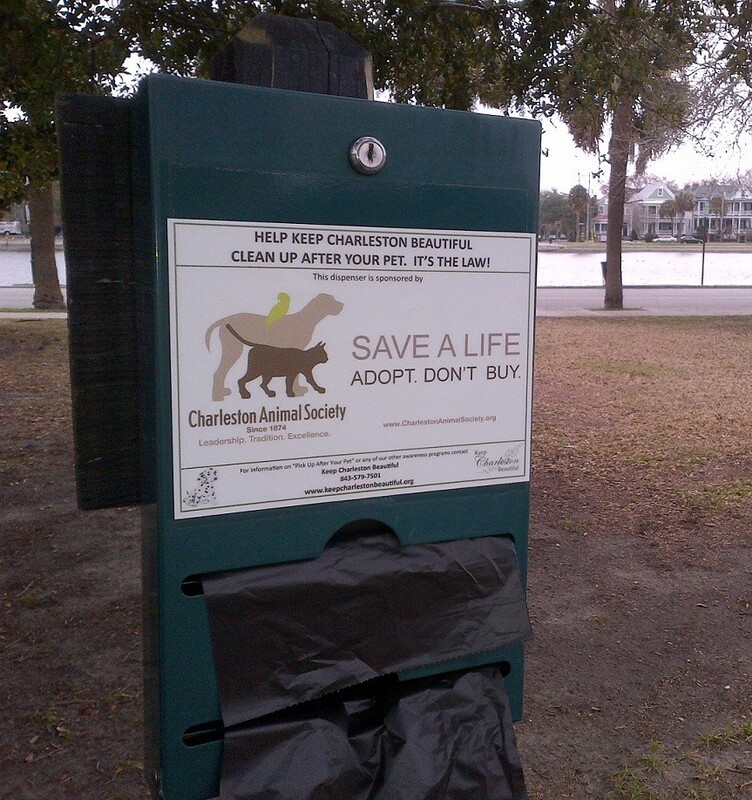 To help reduce pet waste in City parks, Keep Charleston Beautiful and the Department of Parks provide dog waste bag dispensers as a courtesy for public use. If a dispenser is empty, we encourage pet owners to find alternate means to dispose of their pet’s waste. Keep Charleston Beautiful's Pick Up After Your Pet Program provides over 500,000 dog waste bags to the community each year. Waste bags are provided as funding and support are available. You can help support this program by sponsoring an existing bag dispenser for a yearly rate of $200. The sponsorship year runs from September 1st to August 31st, although we allows sponsors to join periodically throughout the year at a pro-rated cost. If you are interested in sponsoring a dog bag dispenser, please contact our office via Email or phone at 843-579-7501. Get a jump on the process by completing our Dog Bag Dispenser Sponsorship Form. Curious where our dispensers are? Check out our map - Dog Bag Dispenser Locations!